Welcome to Caboolture Tree removal. We are locally owned and operated and we are confident in saying we are the best and most affordable Tree and Stump removal service in Caboolture, Morayfield, Burpengary, North Lakes, Kallangur and wider Brisbane Northside Suburbs. We've been tree lopping Caboolture for 4 generations. 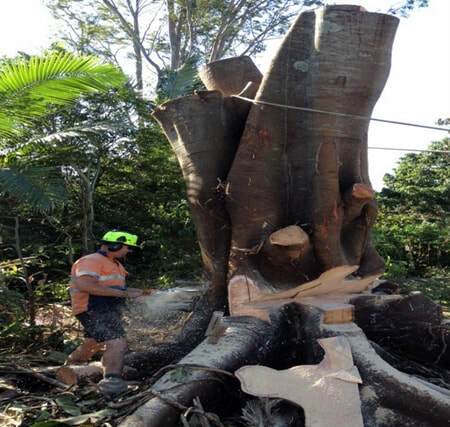 Our fully trained Tree lopping Caboolture and stump grinding staff take pride in their quality work and ensure every safety precaution is taken to ensure your family and house is well protected. We make sure the tree and stump removal process is quick, headache free and easy. 100% customer satisfaction is what we aim for and we offer a large selection of Residential and Commercial tree and stump removal services. We want you to have the yard that you want with as little fuss and for the cheapest price as possible. We also provide responsive emergency tree lopping and tree stump removal in those times that mother nature reminds us how wild our Caboolture, North Lakes and Brisbane Northside weather can be. We are available 7 days a week and our fast responsive team will get to you in the quickest time possible to meet all your tree, garden and stump removal needs. Powerful storms, gale force winds, hail, torrential rain are just a part of living in the Caboolture and North Lakes area. At any time during the summer months a tree can fall and become a liability or even a massive safety problem for your family and your neighbourhood. Our fully safety qualified arborists can assess the issue and give you a free quote to get your home safe and liveable again, no matter what the situation. We will remove the any unsafe tree efficiently and for as little cost as possible. We will respond quickly to storm and emergency tree removals in Caboolture, North Lakes Morayfield, Deception Bay, Redcliffe, Kallangur or anywhere on Brisbane Northside. We are the experts in tree lopping Brisbane goes to. All Tree Lopping and Stump Grinding. Services Caboolture, North Lakes and Kallangur. ​ We do removal and trimming of big trees; gum trees; eucalyptus trees. Tree and shrub manicure and shaping. Palm tree removal and tree branch removal and pruning. Firewood sales including delivery, tree removal, emergency tree and stump removal, tree transplanting, garden tree mulching and tree mulch delivery. Tree removal for power lines. We even can clear your land or block for setting down a slab for your new home. Also have a team of tree surgeon. We do all round tree services. No job is too big or too small. We do all things tree arborist and all our tree lopping and stump grinding work is guaranteed to be the most affordable and best quality with the best tree removal equipment available. We are the best team most equipped tree lopping Caboolture, Kallangur, Morayfield, Narangba, Bracken Ridge, North Lakes Brisbane Northside area has to offer. We are the experts in tree lopping Brisbane North residents trust. We can even stump grind what is left over so you can enjoy your yard with new grass, a nice garden or have some of your trees transplanted by our expert tree doctors and surgeons. We remove stumps immediately as these stumps can be a breeding ground for potential tree diseases and also menacing termites. They can also roots from these stumps can also continue to grow and cause damage to underground water pipes, in ground pools and any nearby concrete slabs if not properly removed. All your trees and branches can also be used to mulch your gardens or install a new garden if you wish. Fill in our tree lopping free quote form and we can come to you anywhere in the Caboolture and greater Caboolture, Redcliffe, North Lakes, Morayfield, Burpengary, Murrumba Downs, Strathpine and Pine Rivers area. We cover Brisbane Northside and Southside, Logan, Ipswich, Bayside, Redlands as well as Brisbane's East and West side suburbs. We don't just do tree lopping Caboolture. Talk over your head and talk in tree speak. Rush you into making decisions. Your families safety is our number one priority. It is our mission to conduct all our tree lopper services with the highest quality and safety. We ensure all our sites are a safe work environment for our staff, customers and the general public. We assess every work area we conduct work in prior to starting to minimise any potential health issues or injury to all people affected by the work we carry out. 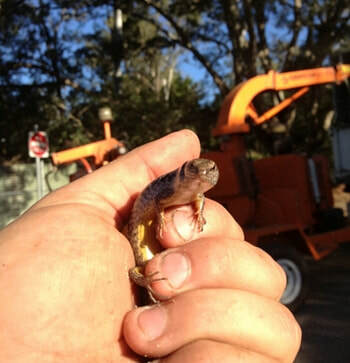 We at Caboolture Tree removal are fully insured for all our tree removal, stump grinding and garden related work. When you contact Caboolture Tree removal you can be sure your family will be safe and your property will be protected from any damage. We adhere to the rigorous safety procedures above and beyond Australian and Moreton Bay Regional Council tree and stump removal safety standards. To keep to our promise of safety we exceed and relevant legislation and do everything in our power to meet and exceed them. All of our staff are well trained in workplace health and safety and general work site risk management procedures. It is ingrained in our company's culture so much so that we require any visitor to our work sites to comply with all requirements of our workplace health and safety policies. Our motto is; If it isn't safe, we don’t start work. We can even advise you prior to work that you have all required Moreton Bay Regional Council tree removal and application forms required in order to avoid any fines. We not only offer the lowest cost tree removal in Caboolture, Morayfield, North Lakes, and Redcliffe but ensure it doesn’t cost you anything more in the long run. Well no job is created equal. It all depends on the size, scope and accessibility of the area, obviously. Contact Us today and we can come to you to give you a free quote. No obligation, no pressure, no hidden extra costs. That's our promise to you. ​Call 0736678052 mention "caboolture tree removal dot com" today and we can organise a day that works for you to come visit at your home or business. PLUS get a 5% discount off your quoted price, merely by mentioning you found us at "caboolture tree removal dot com"
So what are you waiting for? Pick up the phone today and call Caboolture Tree Removal on 0736678052 Or use our handy Caboolture Tree removal online quote form and a free instant quote and some can contact you back immediately with the lowest possible prices for you Tree Removal and Stump Grinding job.